“Marlboro Man is Dead” we read the headlines once again. Mr. Eric Lawson was the fourth in a row of Marlboro classic cowboys who died for smoking-related disease. But why is it an international news? What made the Marlboro Man a pop icon and the most successful branding campaign in the history of tobacco advertising? Many current Marlboro cigarette smokers would not believe that their favorite brand was once targeted to women. However, it was, as was the most of the filtered cigarettes brands before 1950s. Marlboro, a brand created in 1924, initially built its image as a feminine, apparently “safer” due to the filter, light cigarette. “Mild As May,” sold in white boxes with a lot of copy appealing to women and featuring special, red cellulose around the filter to hide the lipstick stains Marlboro targeted young women. In late 1950s, Philip Morris tried to change this image and target more financially attractive group – young males. Marlboro gained fresh, innovative hard cardboard flip-top opened box designed by Frank Gianninoto, who created also famous Campbell’s soup can. The new packaging had many advantages. Its toughness was appealing to men who wanted to protect their cigarettes in rough conditions. The flip-top design forced smokers to look at the pack while taking a cigarette out. A clean, aggressive white with red arrow graphics design (a “rooftop”) was easily recognizable on monochrome TV screen regardless of distortions. Leo Burnett, a Chicago based advertising agency responsible for reaching out to the new target audience came out with the idea of presenting Marlboro brand through archetypal masculine characters. The cowboy character was the first in the lineup and as the history shows, the best and the only one. Leo Burnett did not appeal to the “health benefits” of the filter, but rather ignored any health concerns in the campaign which was in the opposition to other brands. The initial Marlboro Man cowboy was inspired by the Life magazine’s publication of Leonard McCombes photo story featuring Clarence Hailey Long. This Texan cowboy was also the first model to appear in Marlboro advertisements. C.H. Long was soon replaced by other cowboys, firstly paid models and actors, and later, starting with 1963 “Marlboro County” campaign with real, working cowboys performing their working tasks. Mr. Lawson, who passed away on 28th of January 2014 was a Marlboro Man between 1978 and 1980. Marlboro Man since the beginning was an incredibly successful campaign with direct impact on sales. Within just a year Marlboro from niche brand with 1% market share went to top 4 position in the U.S. market. By 1972, Marlboro was the most popular cigarettes brand, and it holds this position since then. A Marlboro Man – why it worked so well? Why Marlboro Man was (and still is on some markets) so powerful? At K-message, we tend to look at advertising with scientific approach, and our analysis of Marlboro Man success is not an exception. Marlboro Man brings together at least three powerful psychological interpretations. Cowboy from Marlboro County is an exemplification of the Jungian archetype. It is the Warrior and Traveller, an unique, American version of the Explorer known from ancient myths. He represents a lone traveler, like the Homer’s Odysseus. To understand more on why and how to use archetypes in branding read our article on archetypes in pharma marketing. Semiotics is a science that analyses how a sign brings a meaning to the reader. From this perspective visuals of Marlboro Man are representing an universal masculinity and values connected to it – reason, independence, egoism. Marlboro Man is also a representation of liberty (but not anarchy) in a political sense. This made the Marlboro Man a sign of not only a cigarettes brand, but also an ethos of American white middle-class in 1970s. Similarly, Marlboro County symbolizes a natural, clean world that is not polluted by marginalizing white middle-class ideas of modern society with women’s rights, racial equality, etc. With time, the visuals were evolving to embrace bigger audience, but one can be sure that Marlboro Man votes for GOP. According to controversial psychologists Satoshi Kanazava, who coined this term, human brain did not evolve much for the last 10,000 years when human specie lived in savanna. If that is the case, then natural environment shown in the advertisement impacts human reaction similarly as it would trigger a reaction of the human in the stone age. Evolutionary psychologists provide some hints towards such thinking. 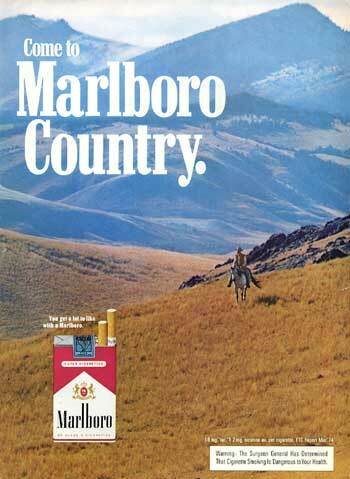 Looking at the Marlboro County from that perspective, we can see that the natural scenery of those ads is either bringing attention (mountains) or provides safety (wide prairies with lone trees). This makes the Marlboro County an attractive place that we naturally want to discover. Those three factors combined make the Marlboro Man so strong, as it calls out the emotional, unconscious positive attitude towards the brand it advertises. No wonder, that the same scheme used for anti-tobacco purposes in the Death in the West movie triggered immediate action of Philip Morris & Co. lawyers. Anyway, now you can see the movie yourself plus an additional documentary on how PMI tried to suppress it. The Marlboro Man is now part of the popular culture. Long after the ban on tobacco advertising, the lone cowboy still reminds Marlboro brand even to non-smokers.